Grant Spencer (left) and Graeme Wheeler pictured late last year. Auckland house prices face a heightened risk of a sharp correction, due to large increases in recent years, the Reserve Bank has warned. There is a “particularly concerning” concentration of borrowers in the city with high debt-to-income ratios. The Bank further warned of the risks posed by rising interest rates, particularly given New Zealand household indebtedness was hitting new record highs. The comments come in its latest six-monthly Financial Stability Report. “Auckland borrowers appear particularly vulnerable to higher mortgage rates. Around 5 percent of existing Auckland borrowers are estimated to face severe stress if mortgage rates were 7 percent, compared to 3 percent of borrowers outside of Auckland,” it said. The Bank reiterated its call to have a DTI-ratio tool added to its Macro-Prudential tool box. Although the continuing impacts of its loan-to-value ratio limits meant it would not be used currently, the Bank said the risk of a returning house price resurgence posed significant risks to the financial sector. House prices in New Zealand remain elevated relative to incomes and rents, and any resurgence would be a concern, Reserve Bank Governor Graeme Wheeler said in the Reserve Bank's latest snapshot of financial sector stability. Although residential building activity had continued to increase in recent months, the rate of house building remains insufficient to meet rapid population growth and the existing housing shortage, Wheeler said. Meanwhile, a "significant share" of housing loans are still being made at "high" debt-to-income (DTI) multiples, with these borrowers more vulnerable to rising interest rates or falling incomes. In a media release, the Bank said it would soon be releasing a consultation paper proposing the addition of DTI restrictions to its macro-prudential toolkit. Vulnerabilities in the housing market had stabilised, with house price growth slowing over the past eight months, the Reserve Bank said. This reflected several factors, including tighter loan-to-value ratio (LVR) requirements on lending to property investors in October 2016; banks tightening serviceability criteria and increasing mortgage interest rates; and affordability pressures had constrained prices in parts of the country. Household credit growth had fallen, but remained high at around 8% a year, the bank said, adding that household indebtedness continued to increase in relation to incomes. “The outlook for the housing market remains uncertain. While building activity has increased in recent years, the rate of house building remains insufficient to meet rapid population growth and address existing housing shortages,” the Bank said in the FSR. “Mortgage interest rates also remain low, despite recent increases. A further resurgence in house prices would be of real concern, given existing affordability constraints,” it said. The Bank said its LVR policy had improved the resilience of the banking system to a correction in the housing market. Although LVR policies had helped to insulate the banking system from a housing downturn, low mortgage interest rates encouraged an increase in high-DTI lending, the Bank said. There's more on the potential DTI tool here. The Bank warned that “many households remain heavily indebted.” The household debt-to-disposable income ratio has increased to 167 percent, above its peak of 159 percent in 2009. Low interest rates have kept this debt level manageable, but many households are vulnerable to an increase in interest rates, it said. Auckland households were particularly vulnerable. “The concentration of debt in Auckland is also particularly concerning given that Auckland house prices are at a heightened risk of a sharp correction, due to the particularly large price increases in recent years,” the Bank said. “An increase in the share of borrowers with high debt-to-income (DTI) ratios has contributed to the increase in aggregate household indebtedness,” the Bank said. “These borrowers are vulnerable to debt servicing shocks, such as higher interest rates or a fall in income. Banks have been reporting data on the DTI ratios of new lending since early 2014, it said, cautioning that preliminary data would likely to overstate the share of lending at high DTI ratios, due to collection issues such as the incomplete capture of borrower incomes. “Despite these data challenges, it appears that the share of new lending at high DTI ratios has remained elevated. Banks report that the share of new lending at DTI ratios above five has continued to grow over the past year for first-home buyers and other owner-occupiers, to 36 percent and 42 percent respectively in March,” the Bank said. It also warned on the prospect of rising interest rates. Preliminary Reserve Bank analysis on the impact of higher mortgage rates on recent borrowers suggested many would struggle to service their mortgage if mortgage rates increased. 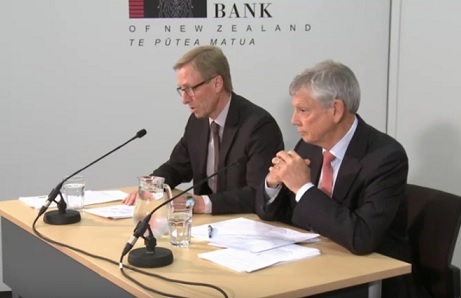 New Zealand’s financial system remains sound and the risks facing the system have reduced in the past six months, Reserve Bank Governor Graeme Wheeler said today when releasing the Bank’s May Financial Stability Report. “The outlook for the global economy has been improving but global political and policy uncertainty remains elevated and debt burdens are high in a number of countries. A sharp reversal in risk sentiment could lead to higher funding costs for New Zealand banks and an increase in domestic borrowing costs. New Zealand’s banks are vulnerable to these risks because of their increasing reliance on offshore funding for credit growth,” Mr Wheeler said. “House price growth has slowed in the past eight months, in response to tighter loan-to-value ratio (LVR) restrictions, and a more general tightening in credit and affordability pressures in parts of the country. While residential building activity has continued to increase, the rate of house building remains insufficient to meet rapid population growth and the existing housing shortage. House prices remain elevated relative to incomes and rents, and any resurgence would be of concern. “Dairy prices have recovered significantly in the past 12 months, and the majority of dairy farms are likely to have returned to profitability in the 2016/17 season. However, parts of the dairy sector are carrying excessive debt burdens, and remain vulnerable to a fall in income or an increase in costs. Banks should continue to closely monitor and maintain full provisioning against lending to high risk farms,” he said. Deputy Governor Grant Spencer said “The banking system maintains strong capital and funding buffers, and profitability remains robust. The banking system appears to be operating efficiently when compared with other OECD countries, based on metrics such as cost-to-income ratios, non-performing loans and interest rate spreads. “Banks have generally tightened credit conditions in light of funding constraints and the increasing risks around housing. Banks are seeking to reduce their reliance on offshore funding and have raised deposit rates. The Reserve Bank supports a cautious approach to managing foreign debt, in light of lessons learned in the GFC. “While the LVR restrictions have increased the banks’ resilience to any fall in house prices, a significant share of housing loans are being made at high debt-to-income (DTI) ratios. Such borrowers tend to be more vulnerable to any increase in interest rates or declines in income. The Reserve Bank will soon release a consultation paper proposing the addition of DTI restrictions to our macro-prudential toolkit. Oh For &()@$ sakes!!!!!!!!!! ,. Just slow down the rate of immigration until we get on top of the backlog . Why is this so hard ? who will stop it? or is the idea to just vote in anyone else? I recall Labour and the Greens crying out for thousands more refugees for example. This is a genuine question as for the first time in my life I have no idea who I will vote for. It is a bit scary when WPs policies seem to be the most sensible! Winston is the only one willing to tackle immigration, so he has my vote, I hope it is not wasted and many others take a similar stance. That is SO disingenuous.....refugees and MASS IMMIGRATION are not even REMOTELY similar. Were you paid to write that misleading remark? yes totally different but unfortunately for your point - much more draining on our stretched resources! I disagree. The number of immigrants is a HUGE number compared to the number of refugees. The immigrants as you say are MOSTLY, but not ALL are wealthy, with skills and education, re; the student scam, parents following after the kids, etc etc. So my point is refugees may be a drain (in the short term, but what price a caring and compassionate country/society ?) BUT immigrants ARE causing MASSIVE mayhem due to our housing shortage. Again I say DISINGENUOUS to try and compare the two and infer it's an either or option, and that BOTH will cause a similar problem to that which we have today !! That's a national policy I agree with - take a manageable number of refugees but support them really well, to give them the best possible chance of making a good life in NZ. Unfortunately from a population and straining of infrastructure stand point they are just as bad as each other. I heard on the news one morning in an interview that after 4 years over half of all refugees [that are able to work] still do not have permanent employment (neither full or part time work) ie they are on benefits or state provided housing/welfare. And what actual numbers are we talking about? .....Now compare that to the immigration numbers. Refugees are a compassionate issue and finance should not be the ultimate or sole decision as to whether we should take them or not. The number of refugees is miniscule compared with the number of immigrants. Refugees number in the hundreds. Immigrants in the tens of thousands. I think we can cope the small number of refugees we take, and for humanitarian reasons it's a good thing. On the other hand the hordes of migrants are having a significant effect, even just in terms of the math. It's immigration policy that needs sorted. It isn't clear in my OP but I am talking about an individual 1:1 comparison, not 750 vs the 70,000 that we currently have. I would agree that the amount Refugees we take shouldn't have a monetary value and only a compassionate one.... if only we lived in a world that wasn't run on money. I'm close to the Mental Health industry. If an outfit can't find staff they need to look at their operation. Some of the DHBs are such antique employers, with grinding civil service ineptitude, it's clear that nobody wants to work there. Any progressive outfit that is go ahead, trying new things, values it's staff, get plenty of applicants. New Graduate nurses don't find it easy to get jobs. Simple but sad fact. But they are the lifeblood of any progressive operation. It's nuts - pun intended. I am a highly skilled experienced Mental Health Nurse from the UK, before I took time off with babies (and also to renovate a house in the UK), I was the Clinical Manager of a Child and Adolescent Mental Health inpatient unit in a London Hospital. I have a degree and post graduate qualifications in the field. I'm married to a Kiwi, so our kids gained NZ citizenship by decent. And achieved Permanent Residency a few months ago but can I work in NZ as a nurse? Can i BLEEP!!! Getting on the nursing register in NZ is ridiculously involved. I will also have to pay to do a course, where I will have to work as a student nurse (without payment) in a random area of general nursing that I have absolutely no idea about. I did a two week taster in general nursing, in my first year of nurse training in the UK many years ago, but other than that, I haven't done anything remotely like general nursing since I left uni. I am specialised in mental health, general nursing wasn't needed. And yet the Nursing Council of NZ want me to pass proficiency in **general** nursing!?!?!?! AND they want me to take an English language test, which I would also have to pay for. I'm bloody English, it's my mother tongue!!!! They also insist on various documents that are impossible for me to provide, like references on headed paper (from a ward that has since been closed) from supervisors who have since retired (because I was in a senior position my supervisors were the senior consultant psychiatrists etc). All of this because I took a 5 year career break with kids. It's no wonder you've got a shortage of mental health nurses, when it is so incredibly difficult to transfer to the NZ register. Yep. If you can't make the grade with clients go work at the Nursing Council so you never have to see a client again. And make up lots of irrelevant mumbo to ensure your job continues. Well, if NZ has a nursing shortage, it's a big problem. I would genuinely like to return to nursing. Not for the money obviously, I can earn more continuing what I do now in IT, but I had a passion and a talent for the work in mental health. I just don't know that I am prepared to take a pay cut, and have to jump through, what I think, are unreasonable hurdles to register in NZ. A UK immigrant I know required the intervention of their local MP (family connected, as is how things work in NZ) to obtain her perfectly legal and rightful NZ nursing registration in the 1970s...during a nurse shortage. Plenty of kiwi nurse grads can't get a job, plenty of foreign nurses with jubious overseas quals are pouring in. Nurses. in most wards are run off their feet, get no breaks and are burning up their sick leave to cope. Another shambles due to overload from a population increase beyond the sustainable coupled with a govt in denial. The same is true in the UK though. I don't think I ever got a lunch break in my entire time working for the NHS although they always deducted the time from my pay, even when I was managing a whole ward! And I often had to wait hours to go for a loo break, just because when you are that busy, that there is no time for a wee. No exaggeration. Lots of UK newly graduated nurses are also struggling to get work, even though the same nursing shortage exists in the UK. This is because, the NHS is so under resourced and over stressed with population numbers increasing, along with health worsening, that the nursing staff that are employed, do not have time to mentor and train the newly qualified nurses, so they only want to take on nurses with experience. Plus, in the UK the registration body (NMC) requires a senior nurse to complete a special course to sign off on the junior nurses. And so the already qualified nurses who are massively overworked and overburdened have to do a uni course, in order to sign off students too. I did the course to sign off junior nurses myself, but all that work had to be done at the weekend after a week of no lunch breaks, no wee breaks and being on call every night. The thing is, the UK couldn't reduce its migration without leaving the EU. Not that i'm commenting on Brexit at all. But nonetheless, with the current government inflicting austerity and underfunding the NHS at the same time as mass migration numbers, it was an infrastructure nightmare. Well, NZ has it problems it does, but coming from the UK, I have some perspective. It's WAAAAAAAAAAY worse there. My husband is a Kiwi, all his family are here and I have no family in the UK, so we were always going to move back here for the sake of the kids (and the grandparents who are getting to old for long haul flights to the UK). I could almost forgive NZ anything for its beauty and beautiful people. I know there is a lot of talk about greed and changing attitudes of NZ-ers in these comments, but I have travelled the world, and Kiwi's remain for me, the nicest, most generous, friendly people (Canadians are a close second). It's something worth fighting for, and that New Zealand attitude is at risk of slipping away. Let's hope as this property bubble caves in that people will consider that there are other things more important than trying to get rich from property. I admire your enthusiasm, gingerninja, and I can understand it to an extent as I am about to be an emigrant myself (leaving NZ). However it will see you in good stead to always remember that Kiwis are no better or worse, friendlier or otherwise than any other people. Kiwis are just folk. Folk with the added complication of desperation and poverty. There are plenty of smiles in developing countries that fade when the wallet is put away. Gingerninja, I hope you can eventually work in your area of expertise! I really do. I think I know how you must feel at this time. My father who is an experienced medical doctor from overseas found it extremely difficult to get registered in NZ when we came here 20 years ago. He had to drive a taxi and work in a supermarket instead until he left for Australia where he could enrol into some bridging programs for foreign doctors, pass his exams and start contributing to the economy as a high tax payer. NZ made it way too hard and eventually missed out on that potential tax money. I love NZ(which is why I live here), but the experience with my father will always remind me that it is not always kind to foreign professionals even though the govt claims that it needs them. If he picked fruit, worked in a petrol station or waited on tables he may have had more luck. It seems as if people with real skills, the skills we need are given the run around while the less skilled workers are needed on mass. My understanding is that immigration adds just as much if not more to the demand side of labour supply as it adds to the supply side. An example - there was an American guy on reddit asking for advice about moving to Auckland recently. Obviously well-skilled, had a job offer with a good salary and appeared a very nice bloke. But by the time he comes with his wife and 3 little kids - that's a house taken, two more cars on the road, 3 places in a school or preschool, 5 people registered with a doctor etc etc. Illustrates the fallacy of migration relieving labour shortages. Then they also get the unexpected surprise that their income is not sufficient to enable as good a quality of life as they were anticipating. He turned the job down once he figured out how much it costs to live in Auckland compared to the US. The company increased its offer, I'm not sure what the final decision was. What? Then rinse and repeat? I think we need to think way beyond that, in this world that needs less, not more of us. If you can't stand the idea of Labour and the Greens making NZ a nanny state, and you are a True Blue but feeling like National/Labour Lite are increasingly becoming the socialists month by month, then for gods sake give your vote to Winston Peters and NZ First! They know fully what they are doing, they just don't care - it just an attitude of "let them eat cake". Labour has the same attitude except they will take a larger portion of your cake and give it to the beneficiaries. There will be two classes, wealthy immigrants and the remainder renting in housing estates. Unless the sheeple wake up and truly vote for someone who is going make a stand then I fear we are sunk. I actually think this is one of the most important elections as we are at the fork in the road and there will be no turning back. I have zero faith in this mob - where have they been correct in the last years? Inbound migration hasn't changed and there are still approx 12,000 houses for sale in Greater Auckland and staying constant for last 6 months. Rentals are also constant at between 3800-4000 properties. "The Reserve Bank will soon release a consultation paper proposing the addition of DTI restrictions to our macro-prudential toolkit." translated: heads up guys, DTI is coming! That's a variation of National's standard "go-away" line of "we are looking at it"
Supply or no supply. How many FHB can afford a million dollar house unless they decide to buy a small unit that too for 800s or move out of Auckland and search for job that too if you are lucky as will be cpmpeting with lot of immigrant who are ready to work for free or peanuts. National has achieved what it set out to do, wiped out low and middle class from Auckland but need them to do manual work so come up with dole but no hope for future. House prices normally double every ten years in NZ so with a 700k medium now you are looking at 1.4 m in 2027. The Fiat monetary Ponzi scheme (which got really out of hand after Nixon took the world off of the Gold standard (Bretton Woods version) in August 1971) prints (out of thin air and gives it first to the really wealthy, so they can benefit HUGELY before the masses!) prints so much money. This PLUS Governments (STUPID) tax rules (and presently immigration and overseas buyers rules), has allowed Auckland housing market to nearly double for a few of the randomly choosen ten year periods. BUT THIS CAN NOT continue and housing WILL crash and correct. The real question is how much of a mess will be in just before it crashes (we're GUARENTEED to be in a REALLY BAD mess afterwards), by our Govt inaction to allow this bubble to get so out of hand. Mind you with the OBR you are potentially damned if you sit on the side lines in cash and damned if you don't.....UNLESS ........you pay off all your debts, downsize the house and invest (whatever you MAY have left) in PHYSICALLY precious metals outside of the banking system and preferably in your own hands. So you are saying that house prices are an exponential curve not linear ? Prior to August 1971 house prices historically had risen at about 0.5-1% above inflation for about 50-100 years, excluding wars, and probably a lot longer, but data is a bit unreliable for so far back. See the (Robert) Shiller housing report (USA) that was done about 10 years ago and is still referenced today to show how out-of-wack (i.e. DUMB) the house prices are. Goodness, the Auckland middle class having been wiped out by the government and forced into manual work, is grim news indeed. Sounds a bit like the Khmer Rouge in Cambodia. Are the CBD office workers being trucked out to Pukekohe to work on market gardens? Soon, those Million dollar house owners would also be dole, perhaps ? Oh, so when is the crash happening then? So are house prices going down in the next 12-18 months ? - I dont think so , neither does the RBNZ. Time to buy I reckon as long as the market is soft ... Sept is only few sleeps away !! The market will probably crash due to 'issues' happening overseas, more so than NZ. So NOT being able to define when a crash will happen is NOT proof that it will not happen. How many people can define EXACTLY when a drug addict will die, 'crash' etc? That doesn't prove that 'they' won't happen to the drug addict !!! Agree - houses prices may fall a little bit in the short-term but, equally, they might rise a little bit in the short-term. On balance, the chances are house prices will be relatively flat over the next year or two. Whatever, a sharp fall in house prices is most unlikely to eventuate. It's like the calm before a storm. The village idiot licks his finger and sticks it out in the air then says "It looks fine outside. A bit cloudy and a bit dark, so there's a chance it could rain, or there's a chance it could not. No need to panic". Meanwhile, everyone else went inside the house and prepared for the storm because they listened to the weatherman (because, you know, he's an expert and actually studied weather patterns). He may not be 100% right, or may not accurately predict exactly WHEN the storm will come exactly, but it does pay to take his warning seriously. Whatever goes up comes down by what percentage is a question mark and nothing is one way street. Having said that people who have bought houses for a long term is safe for even if it goes down or remain flat for few years have nothing to worry. Some DTI loans may be supported by under the counter rents of so called flatmates (boarders.) And boarder numbers can be further increased in dire circumstances. Addendum. What this may mean is that an unknown percentage of high DTI ratio's may not be so risky as first appears. The Lenders will work from audited accounts/IRD returns ( the same as they want to see a regular salary going into an account held with them at the moment). Rent from flatmates might be the last thing an owner/occupier would want to put on their tax return? Except anyone from overseas are again at an advantage as they can manufacture their income, though I think the Aussies have tightened up on that little scam. Introducing a DTI ratio is protecting the banks at the expense of FHB. Just stop immigration. I have noticed as well. Can't recall seeing any headline regrading the latest immigration numbers? Here we go censorship, we can't have Key and Soros' plan for globalization derailed can we. It won't be long before you have your Twitter and Facebook accounts suspended for mentioning immigration (its just not PC you know). In other words just keep quiet accept the invasion, the fate we have assigned you and just to make sure we won't inform you of it. Headline behind NBR paywall says in 2010 National stopped wealthy property investors getting Working For Families tax credits. It then says Little and Robertson are campaigning to bring it back in. The crash is happening now and its about to get a whole lot worse. Music stopping, and there might just be a lot more than one chair missing in the game of debt as it flushes and spirals downward. NZ needs to return to a reasonable price/income ratio. Two options, massive wage increases = massive inflation in everything, or, correct the stupid house prices. Correcting the stupid house prices only effects the donkey supporters playing the game of debt. Old people (reliable voters) who are not donky deep in property debt and not earning, are actually better with option two, otherwise any retirement savings will become a faded memory - worthless in a world of massive inflation. So a great time for an election now less than 100 days away. One can vote to maintain the game of debt (NAT), or to change it to something else. Recommending the following please. b) exclude overseas property ownership and tax existing non citizen owners, 50% cap gain tax anyone...? c) introduce DTI to stop domestic farming of debt interest tax offset. If the game of debt gets flushed, houses and attached debt can get iliquid real fast. Hang on for your hats campers. It's actually far worse for pensioners. Most found their interest returns dropped so much they had to do something about it. A lot went from having term deposits to buying property to keep their returns up. Essentially the Government and RBNZ has encouraged pensioners to buy property and will now have to cut the property prices back. In the end everyone is getting shafted except speculators that hop in and out of the market to collect profits. All this waffle from the very same RBNZ overseen by Graham Wheeler. that saw 4 Australian banks give out promotional Ipads , money back and indeed grocery vouchers to entice the willing as credit growth almost reached stall point. If mortgage rates hit 7 percent on average, we will be paying 17000000000 in interest alone to 4 Australian banks. Forget mortgage stress, the economy would crater. What the RBNZ is omitting is why mortgage rates would be rising .Truth be told , we dug a hole, craters are quite large. But, with net margins somewhere in the 2's, that would also mean roughly $10b back to depositors in Australian Banks. 2 sides, same coin. That would effectively limit immigration to snails. Hermit crabs are just freeloaders and move into something built by somebody else. Forget national household debt , again the RBNZ is misleading. Focus on Auckland housing debt, one needs to add a page to the chart. Bill English you were given the hospital pass . Wonder why Wheeler is jumping ship. Wheeler has served out his contract and has reached retirement age, so him standing down is hardly surprising. He's been decent, honourable and competent in the role of Governor of RBNZ. RBNZ is fortunate in attracting people of his calibre (and that applies to Alan Bollard as well). Talk of Wheeler "jumping ship" is silly. I voted for this National government in the past. I'm now absolutely disgusted by what they have done to this country, sacrificing the chances of young Kiwis for the benefit of older land and business owners. In many cases going against their own campaigning statements and espoused ideology. It's not just the young, Rick. Im a business owner in my late 40's who sold our home to help fund the expansion of our business. Two years down the track and dealing with the joys of renting and looking at the price of homes with disbelief on our faces. We are some of the lucky ones in that we will have a chance to buy again as we still can get together a deposit). Still we don't want a horrendous mortgage with only 15+ years available to pay it off so will be looking for something way more modest than we had. But prices are completely out of whack even in Tauranga where we are and I despair for my twentysomething offspring. This government should be so ashamed of themselves. I'm glad my grandparents aren't around still to see how unequal life in NZ has become under National. They'd be so upset. It's not the sort of country they worked so hard to build. See, this is what I don't get, too. How do we have so many incredibly selfish people driving things now? Politicians who grew up on welfare, pulling the ladder up behind them (IIRC the outgoing children's commissioner noted that impoverished children now receive only one sixth of the support they did in the past, e.g. when John Key was one). People who benefited from affordable housing created by the policies and efforts of previous generations, who now see housing as only about what can be of financial benefit to them (and stuff the next generations!). Politicians who are happy to sacrifice the environment and viability of life that will be left to young and coming generations of Kiwis, just for short term financial gain for their voters. Was John Key ever idealistic for New Zealand, or just aspiring to be PM? Don't our politicians have any care about what's left to Kiwis who follow? Rick - I came to the conclusion around 2011-2012 (and at the time being a National voter) that John Key's real ambition was to be PM, whatever it took. The appearnce of caring about the future of NZ was purely out of self interest (political). I should add, too, it's good to have more examples of how this is affecting more than just the young. The young are readily castigated for eating smashed avocado (AKA The Antichrist), being spendthrifts etc. (when in fact they save more than previous generations did) and told these are the reasons they can't afford a home. I see this as a blatant dodge of responsibility, little more than an exercise in assuaging guilt for the breaking of the social contract that this abandonment of affordable housing has been. Interest published a while back an article highlighting the effects of the housing crisis on couples who divorce - i.e. after halving assets, neither can afford to re-buy in their same suburb. It was only when I facetiously suggested that all the divorcees needed to do is work hard, save, avoid smashed avocado and Sky telly, that it's never been easy to own a home etc....It was only when I facetiously used the same arguments that it seemed to highlight to many of the usual proponents just how absurd they are. I barely recognize the City I've lived in - the rate of change in the last 5 years is terrifying. I find it hard to believe that any rational thinking person can believe this is the course we must take and that it is sustainable in any way - house overcrowding, pollution, appalling congestion, crimes we've never seen before (people trading, money laundering in HUGE amounts etc) but apparently this is "JUST ABOUT RIGHT" according to Bill English. Extrapolate this forward 10 years and Auckland will be a slum..and the repercussions will spread through the county. One this happens how do you turn it back?...you cant! I like money (really like it!) but not at the expense of others OR at the cost of my standard of living which can not be quantified in pure $ terms - these soft benefits are always ignored. And I wont crap on fellow NZ'ers or next generation simply from greed. But the attitudes I see from many of my peers frankly sickens me. Greed beyond the belief with no thought given to the "timing" advantages they enjoyed. You are not alone Rick - I'll be voting for change this year - 1 issue trumps them all for me - current immigration is the cornerstone of many of these problems in my view..
For renting out a caravan, the Headline says, Sandringham, 3 Bedrooms ? Hilarious, to say the least..
Not a caravan, an aged Toyota Estima. http://www.trademe.co.nz/flatmates-wanted/auction-1324357194.htm - Is this legal? Line up half a dozen in the backyard, nice little earner. Perspective folks! It's $99 per week for a house AND a car! What a bargain! "Countdown, Mcdonald, Warehouse and bus stops are 1 minute drive"
If I may drive my peoplemover-house up the road for 3am munchies, Slum McLordyson, you've got yourself a deal. Where does it say it goes? I'd expect to pay twice that for one to drive. Nah, I'm sure you could hitch up some oxen to that bad boy, get it going real good. Just tax 'em from a paddock, no worries. Good feed there when you're done with them. Way of the future. Get on board. Agree with every single point mvgsmf , and pretty much in the same boat. This may sound privileged as at least we have a roof over our heads but yes that quality of life factor is so important. I wonder why it doesn't seem to bother Nat politicians. I know they might have plenty of dosh but many of them live in Auckland and surely they are still getting stuck in the endless traffic and dealing with the hassles of trying to get to the Koru lounge etc. I suspect they don't all have chauffeurs or private planes so can't they see how crappy Auckland has become? And all anyone can talk about in Tauranga now is how annoying the traffic is here too and how much the town has changed for the worse in the last year or two. When it takes you 45 minutes to get 5km across town in a place this small you realise the quality of life factor is deteriorating in places outside Auckland also. Mind you I don't blame Aucklanders moving here for a better chance in life. They aren't left with many options. And if you have kids too...having to chose between spending the wealth windfall from your house and forever excluding your kids from home ownership, or doing it harder just so they can have a chance at home ownership through inherited wealth. Previous generations of pensioners could at least use their wealth at some point because doing so DID NOT mean excluding their kids from home ownership. I also have witnessed first hand the demise of Auckland which is still a city I call home, but I don't live there anymore. It was such a beautiful place to live, but it got to the point where I suddenly couldn't stand it any longer and made a sudden decision on gut instinct to get out. I still miss alot of aspects about my old hometown, but it would have been financial suicide for me if I stayed any longer. My savings account was starting to diminish at an alarming rate month by month. One day I may return, but for now I am happy with my decision and no longer have stress about money. I am now working on getting my daughter and her partner out of there for a better life! "I like money (really like it!) but not at the expense of others OR at the cost of my standard of living which can not be quantified in pure $ terms - these soft benefits are always ignored. " This is so true, Ive always said to people in the UK that when I go home to NZ, we dont have high wages compared to the UK but we have a million dollar lifestyle. But this is slowly eroding. I am nearly in my 60's and watching my entire life's work and savings disappear in a puff of smoke. Ive done exactly the same, used my mortgage money to start a business, and house prices have gone beserk. My only hope is to get my business going, and move somewhere cheaper to get equivalent property. How about the new landlord subsidy that Joyce just introduced? Will that allow sufficient increase in rentals to protect landlords from increases in interest rates? Remembering of course that those increases will also mean a bigger tax deduction for them. How about we stop and start to REALLY start to think where the problem lies. The reality is that there are many jobs in Auckland that have absolutely no reason to be there and this is increasing so due to technology. Take the example of the AA Insurance call centre - why is this located 100 metres off Queen Street up towards the Sky Tower in prime CBD land. What is the rationale? Workers have time and cost issues with transport to work and it just adds to the City's congestion and pressure on inner city property prices, and for AA the rents for property are considerably higher that in many suburban and regional centres. Aucklanders - individually and companies - really need to start taking far more ownership and start to acknowledge that they are contributing to the problem and rather than taking the blame shift option and simply slang the government and start to do something to alleviate the issues. You are completely correct. Up here in Kerikeri every other person I meet have moved here from Auckland and they all say they should have done it years ago. If these whiners can't buy in Auckland they should buy elsewhere, there is a huge shortage of rentals up here. Before they know it they will be able to get into the Auckland market. Not buying and just moaning is not the way to go. I bought my 1st house 46 years ago and we really stretched ourselves and were told we were mad. We worked jobs during the day and worked on the house in the evening and weekends to improve it. We have always done that and over time you can build up capitol. We have only ever had 4 homes and for a short term had a couple of rentals. At 67 I'm still at it and am helping my son improve his house in Wellington ( yes I pursuaded him to buy a do up) We have also just bought a big do up for a seaside home in Eastbourne. I don't care if the market goes up or down, you should always look at the very long term if you are young and just buying a home. Over 46 years I have seen many downturns but the trend has always been upwards and it always will. My advice is to either buy out of Auckland or buy a crap house and use your spare time doing it up. Learn the skills on the job, it's easy now with You Tube. Don't be a whiner, take your future into your own hands and think long term. How many foreigners and immigrants did you have to compete with when you bought your first house. Wait, I got this, I'm about the same age so I guess it would be about the same as I had to back then, nil, none, nada, zip. And I seem to recall our first house was about $24,000 which was considered pretty pricey back then, but it was on a third of an acre and over looked the Manukau Harbour, right on the edge to be exact, just down the bank to where the boat was moored. And how many incomes did it take? One, it took one income, that of one person in the building industry but not an apprenticed part of it. Yes, indeed, tough times were they. Fact: Every ancestor of every person in this country came from somewhere else. We are all of us descended from immigrants. I do not see my point as any more silly than your taring immigrants with an unbalanced argument. Yes, immigration has increased demand. But to conclude that increased demand is therefore bad and imply immigrants = bad is missing an entire half of the problem description and quite unbalanced. When demand for houses increases the obvious thing to do, which people have done for many centuries at times of increased demand, is build more houses. The fact that this thing we call "a housing market" has been so regulated and constructed by 30 years of poor government (local government included) as to make it near impossible to build houses fast enough to meet demand. Foreigners are easy to blame, but the dysfunctional "market" we made all by ourselves. Indeed we made the dysfunctional market ourselves, by having an all but open door immigration policy without any thought to infrastructure or what sort of population we actually want. Tell me, how many do you think is enough? You have to make a distinction for "First Nations" and "First Peoples"
Thats just silly, your not an immigrant if you were born here. Yes an ancestor of one, but still not part of the immigration problem. Nothing wrong with immigrants as well, just 70,000 a year and hundreds of thousands a year on education rorts and temp work visas. I think you'll find that ralph was merely correcting pocketaces implication that there were no immigrants 50 years ago, which is factually incorrect. There was not the number immigrants and more importantly there was probably zero foreigners buying houses, which was the more important one of the two, but oh well. I am a foreigner. I come from Wales.. That's ok though just as long as I'm not Chinese. Grow up PocketAces, how long ago was it that your family were foreigners? Part of the reason for a change in prices was because then usually only the husband worked full time whereas now both work and that is reflected in the price multiples of wages to house price. You're not really a foreigner if you come from Wales. Immigration is about numbers and allowing people to buy houses from another country is just plain stupid and if we do decide to address it we would not be the first. And with two average wages now houses prices are still well out of whack. Foreigner is someone who is a) not a citizen b) not a resident c) both of the former and not living here at all. I don't think we should consider Irish, Canadians, Welsh, Scottish, English or Australians as foreigners. I wouldn't buy an over priced Auckland shack right now with a 30 year term loan. It doesn't stack up in against any math formula! Don't buy now! Wait it out, or move if you can until some form of reality kicks back in. Never try to catch a falling knife! "Paper still in the works"
Toilet paper? Looks like we're going to need it soon. RBNZ can only warn but nothing will be done and can be achieved without change of government. Many reason to vote for change. A great many large parcels of land are now for sale on Trademe Seems to me development is NOT the way to go. Heaps for sale already with resource consent - too risky and too expensive to proceed. No way we are going to build our way out of this crisis. Supply is not the only reason for current housing situation as argued by national. Supply has always being an issue but the rise in demand is culprit and more so rich non residents supported by national.. Looking forward to election for change of government and my toss will be between labour or Winston ( More towards Winston but he may go with national for power so reluctant). Winston had long refused to work with the greens. My feeling is he will go with Nats to get Deputy PM job. Can't see Nats not in power for the next 6 years. Nats supporters may be surprised. If the Nats are in power for six more years we could well see a major swing subsequently to a party such as TOP who promise a move away from having all the tax burden on workers (income tax) toward more on the landed gentry and less on workers. Or heck, even the rise of extreme nationalism because of the marginalisation of young Kiwis. Mass immigration is the root cause and the easiest demand input to change. Targeted taxation next. Interest rates and other demand factors cannot be altered as directly by Govt. policy. Re supply;we will never build our way to affordable housing until we have lower population growth. Need solution : Any solution can only start with change of government. 9 years of power makes people arrogant and start believing in I, Me, Myself which is clear from the current government. The housing problem started 30 years ago. Multiple changes of government haven't changed anything. You are correct but when things stretches to extreme, their will be a change and this election will be a vote for change. Albert Einstein was an immigrant. Anyone noticed how the talk over the last year from politicians & govt has changed from "flattening out" & "stabilising" to "cooling" & "correcting"
And guess why it's slowing down? Same reason why we're re-correcting (Crashing because we didn't have a foreign buyers tax). How about the "nothing really changes and life goes on" option ? seems to be working so far the rich get richer and thus have all the control and the rest that cannot get over the bar just get left to languish in no mans land. You cannot beat human nature at the end of the day, we are where we are right now in history for a reason so what makes you think anything other than WW3 or a pandemic is going to seriously change it ?